This is the PERFECT treat for all cookies and cream lovers! It has an easy homemade Oreo crust with a delicious creamy center and is topped with whipped cream and chocolate. 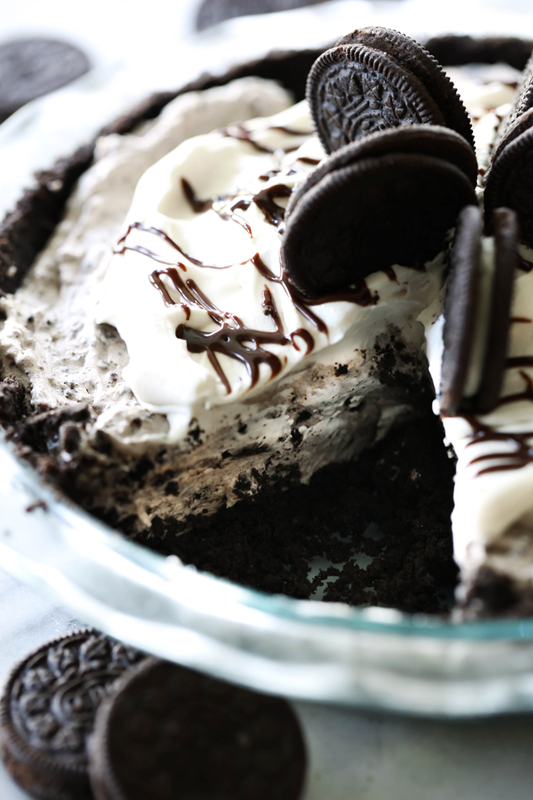 This No Bake Oreo Cream Pie is the perfect dessert for summer. The father I want to talk about in today’s post is my darling husband, the father of my children. He is such an example to me and encourages me to be better every day. He is the most witty and funny human being I have ever had the pleasure of knowing and I thank him for the laughs he sends my way every single day. My husband is kind of funny. You would think with all the baking I do around our house, he would be obsessed with all the goodies, but he is actually not a sweets person at all. Seriously. He prefers the saltier things in life. That said, he will sit down to a sleeve of Oreos and a tall glass of milk and devour it like it is nothing. I created this recipe with him in mind. We are actually going to be enjoying it later today for his Father’s Day treat. This is my husband’s FAVORITE dessert. Did you catch that? FAVORITE. DESSERT. Soak it in. Of all the treats he could have, he would choose this. It has a delicious Homemade Oreo crust and a wonderful Cookies and Cream cream filled center. It is topped off with whipped cream and drizzled with chocolate. It is heaven in every bite. I won’t tell you how much I had, but just know this is one highly addictive dessert and good luck stopping at one slice. It is near impossible! This recipe is PERFECT for summer as it is a no bake dessert so you don’t even have to turn on your oven. 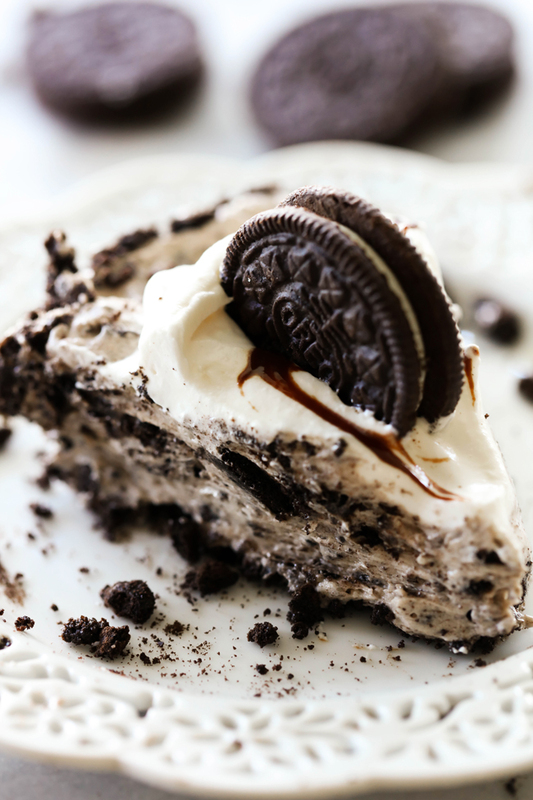 Cool down with a slice of this No Bake Oreo Cream Pie this summer, you will NOT regret it! 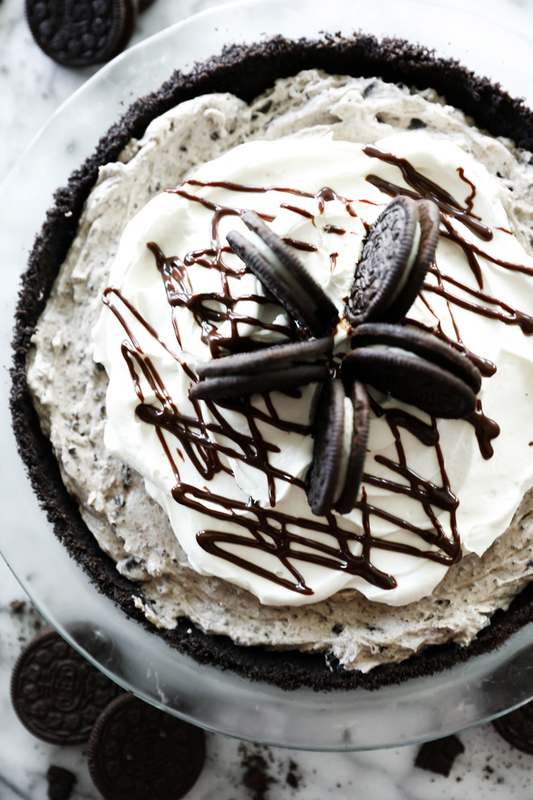 This is such an amazing dessert with a delicious homemade Oreo crust and cookies and cream filling! It is my husband's FAVORITE dessert! In a separate bowl beat cream cheese and sugar until well blended. Fold in whipping cream until smooth. Add Oreos and stir until completely incorporated. Carefully spread whipped cream over the top of pie. Drizzle cooled hot fudge over the top, arrange Oreo cookies in center and serve. Do I use powdered sugar or granulated sugar? I would love to make this! Looks delish! Use granulated sugar if you put it in before you whip it, use powdered if you add it after its whipped. This our newest favorite pie recipe! However, our nine year old can't have chocolate at night, so I'm going to make the same recipe with lemon oreo cookies and a lemon zest sauce drizzled on top, and see how it comes out.